V-Ray for SketchUp (ver. 1.48.66) has the new added feature of IES Lights and Spotlights. 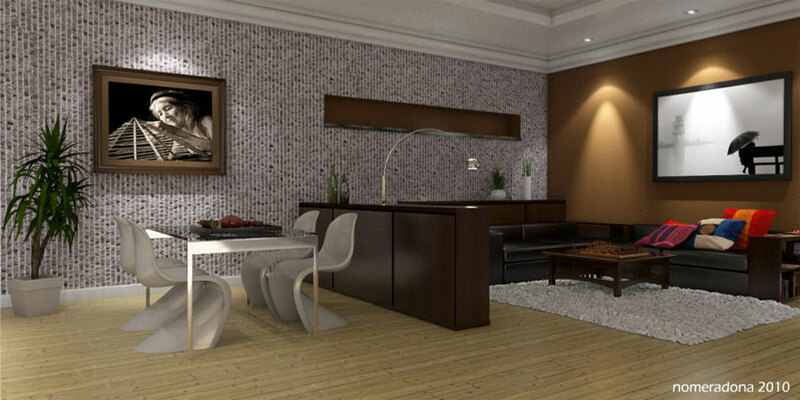 V-Ray works within the SketchUp environment allowing users to be able to efficiently incorporate the task of rendering within their current workflow. IES (Illumination Engineering Society) is a standard digital file in ASCII format, which measures the distribution of light, in other words the intensity of the light and its shape. 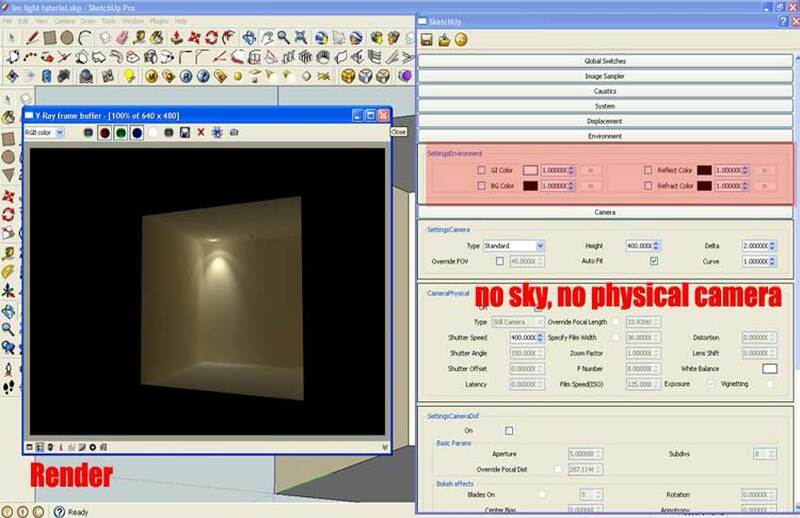 Lamp manufacturers create these files for accurately simulating their lights and now we have the ability to add IES profiles (for light accuracy). I have a new second tutorial, just published called Basic IES Light Tutorial using V-Ray for SketchUp. I use V-Ray release version 1.48.90 in it, which is a much better and stable release. Here is the room set up. 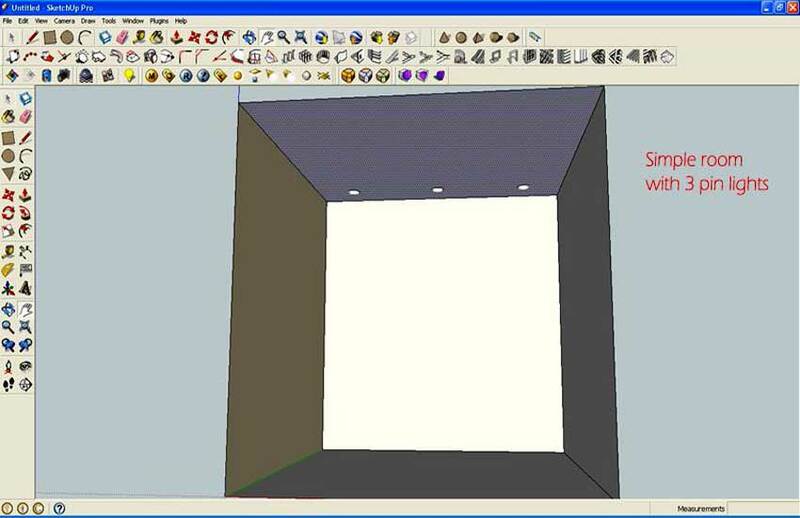 A simple box with 3 pin lights as shown in the image below. Follow the steps highlighted in the following images below. And here is the render where I used 3 different types of IES light data. You will see the rendering time using default setting with no sky and no physical camera, the rendering time is just 14.7 seconds. 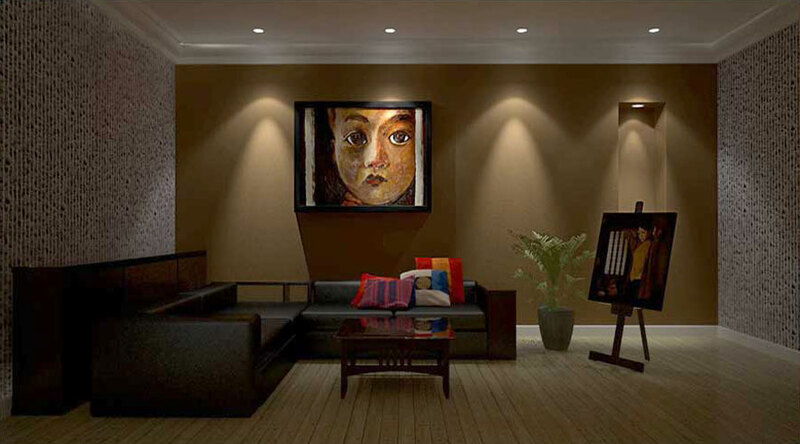 You can also see the difference in the spread and intensity of the three lights. Some sample render scenes using what we have learned in this tutorial. 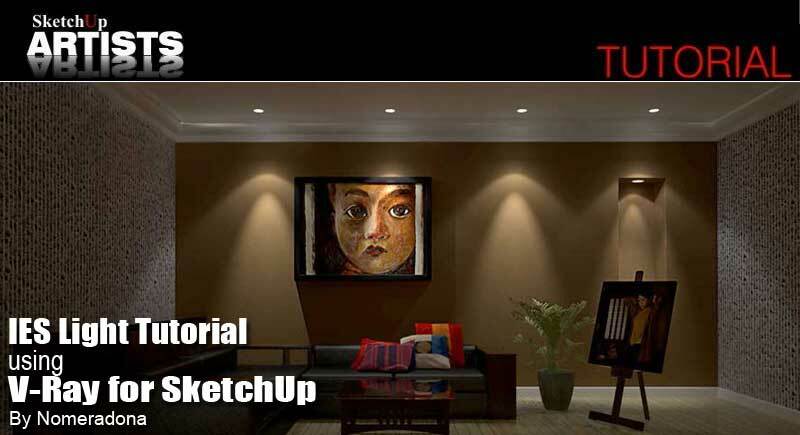 Check out my second tutorial on IES lights (Basic IES Light Tutorial using V-Ray for SketchUp) which uses a less ‘buggy’ release version of V-Ray for SketchUp. 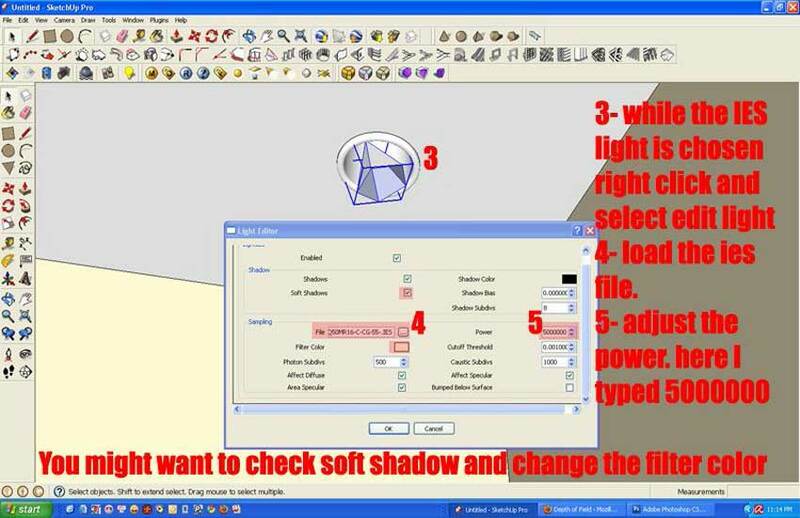 Also here is another short tutorial on using IES lights in a 3ds Max work flow, may be useful in helping you understand the concept and use. Tried all the steps, though am am not able to get the render right. Can anyone help me out with a step by step tutorial? You are truly a genius, thank you so much for all the help you give us! this is so simple and great thanks…. 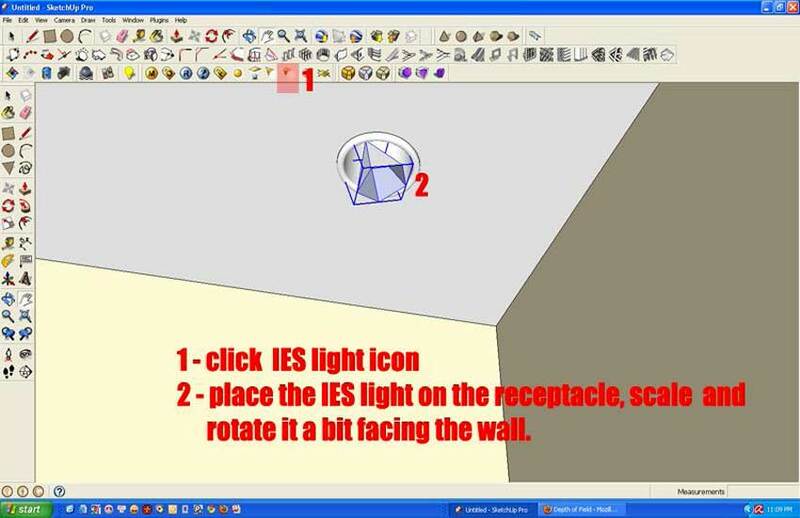 Hi Nomeardona i have a huge problem; i have started to put in my IES lights in my sketchup model. the first two worked great then i tryed to copy the third one from the first IES light and it didn’t want to work. i then stoped and carry on with another IES light with diffrent properties and it work i then copied it again and both the IES lights doesnt show in the rendering but the previous light that didnt want to work works now. but everything that i want to put in now doesnt work at all. 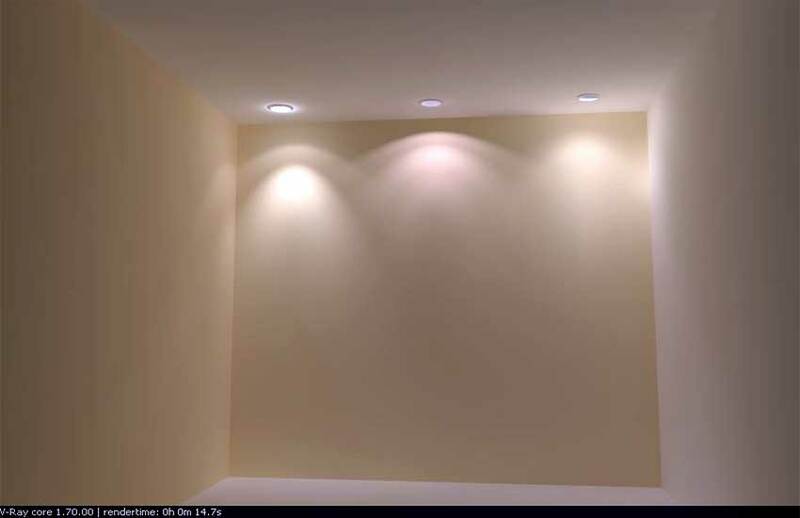 the only lights that does show when i render is the thirst three that I have done. I went through all my settings and i cant find the problem. please can you help me. It is Very Good .thanks for you . nice and simple… awesome for the begineers like me… ! !